Some have noticed that the water levels are not dropping as quickly as usual. The wet spring means there is good water supplies still and Wilstone only came off the weir level in July, more than a month later than normal. Roy Hargreaves - This morning started murky with low cloud cover and while walking round to the jetty a Tree Pipit flew overhead, roughly heading south-east and almost following the line of the path along that bank. 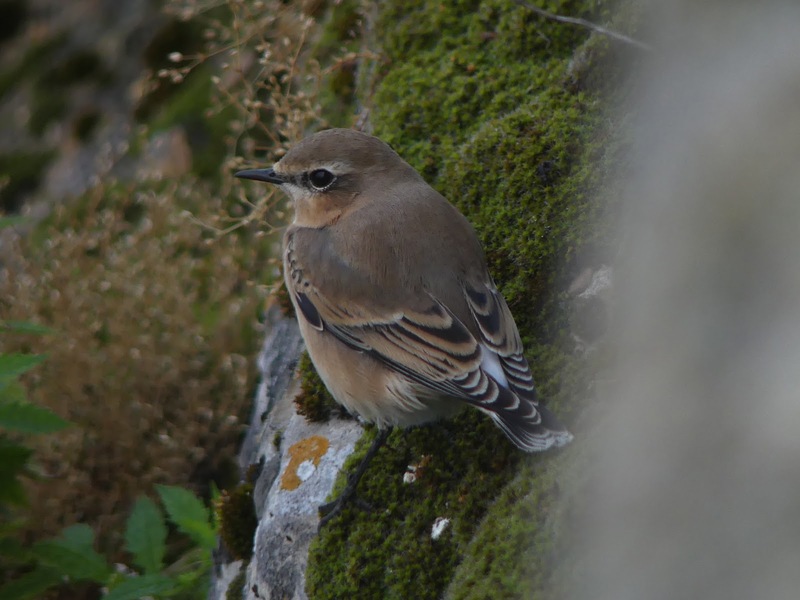 On my walk back round to the car park I saw a Wheatear fly along the bank in front of me and it was fairly confiding when on the lower bank. Also at Wilstone was a Hobby, a female Red-crested Pochard, seven Little Egrets, two or three Common Sandpipers. Marsworth also had a Hobby, but otherwise I saw little else at the smaller reservoirs. Last Thursday I saw a juv Arctic Tern at Startops in both Herts and Bucks section, which I don’t think lingered and isn’t the bird shown on birdingtringreservoirs.blogspot.co.uk/. It may have flown over to Marsworth but I didn’t see it there. Last Tuesday there was also a Redstart in the hedge by the new overflow that runs towards the road and also at least two Spotted Flycatchers in the same hedge. I have also been seeing badgers on a reasonably regular basis before 6am as I walk down to Wilstone, which is always a treat. Gary Hinton - Few from Wilstone on my camera phone today. Thought that the one from the hide after the veg cutting would be interesting, then a bat came from the reed area to the right of the hide! I watched it for at least 5 minutes, feeding on insects & taking water, before it flew back right of the hide towards the reeds and trees. This was around 13:30! Wish I'd taken my camera. Water Rail screaming around 17:00, Reed Warbler, Around reeds willow tree crematory corner Yellow wagtail x 2 near steps to farm shop Little Egret x 6 Common Buzzard x 2 Red Kites Grey Wagtails x 2 Pied Wagtails numbers of juveniles Goldfinches Numbers of coot. Kingfisher passing in front of hide. Common Sandpiper X 3 moving around the mud areas around the hide. Moorhen in numbers near reeds right of hide. At least 30 Lapwing on the spit. Few Teal. I think I also saw some six pochard with maybe a red crested but it was to far away for my bins to call, they went behind trees far right of spit. Number of Heron.